New Delhi: With no response from the Medical Council of India (MCI) on their issue of their PG Diploma seat conversion till now, various doctors who are currently pursuing their post graduate diploma from various medical colleges in the country have now approached the Supreme Court for relief .The matter is tentatively listed for the 8th of April,2019. The doctors have demanded that in the light of the current de-notificaiton of the PG Diploma course and the corresponding conversion of these seats into degree courses, benefits of the policy move should be extended to the current batches, who are pursuing these courses as well. 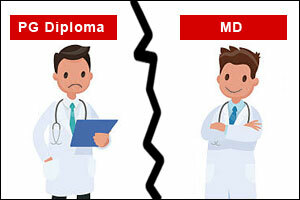 Medical Dialogues had extensively reported about the move made by the government to scrap the 2- year PG Diploma courses from medical colleges across the country from the academic session 2019-20 and in return grant the medical colleges with an equal number of MD/MS seats. However, the decision being for the future batches leaves behind around 4500 doctors who are currently pursuing their PG diploma courses at various medical colleges across the country. Now with 548 seats re-notified, this pool will also rise. These doctors who belong to the 2017-18, 2018-19 batches had asked the Health Ministry as well as the Medical Council of India, to extend the benefit of conversion to them and allow them to take MD/MS degrees by pursuing one more year at the medical colleges and submitting the thesis. However, with no response from the council till now, and exams fast approaching, the doctors gone ahead and filed a petition in the Supreme Court. ” At the time of admission, people chose diploma in a certain subject despite having the option of MD/MS in some other subject because of their interest and desire for excellence in that field. However this current trend for conversion of diploma seats to MD/MS has paved the way to undermine their candidature. The fact that the BOG feels that the conversion of diploma to md/ms seats is a measure to reduce the paucity of specialist medical professionals and medical teaching faculty itself exemplifies the fact that they recognize the diploma holders are unable to fulfill any such gap. And yet they have not provided any relief measure to candidates who are NEET qualified & devoted their years to reach at this stage,” Dr Rishikesh Singh, one of the 20 petitioners in the matter told Medical Dialogues. ” It is important here to understand this policy move, the government also will be benefitted because to get MD/MS , government has to invest 3 yrs & 50 lakhs on individual , but here by adding only one year to ongoing diploma ,6000 MD/MS will be available at low investment & within reasonable time ,” Dr Rishikesh Singh who is also the President Medical PG Diploma Association Maharashtra informed Medical Dialogues. Any update of the hearing in SC on 8th April 2019. Or can any one please provide the Case No. for benefit of all and looking up on SC website ourselves.